• For quantitative determination of cholesterol and evaluation of drug effects on cholesterol metabolism. • Sensitive and accurate. Detection limit of 5 mg/dL, linearity up to 300 mg/dL cholesterol in 96-well plate assay. • Convenient. Room temperature assay. No 37°C heater is needed. • CHOLESTEROL is a sterol and lipid present in the cell membranes, and is transported in the bloodstream of all animals. It is used to form cell membranes and hormones, and plays important roles in cell signaling processes. Elevated levels (hypercholesterolemia) have been associated with cardiovascular diseases such as atherosclerosis; whereas, low levels (hypocholesterolemia) may be linked to depression, cancer and cerebral hemorrhage. Simple, direct and automation-ready procedures for measuring cholesterol are very desirable. BioAssay Systems EnzyChrom™ Cholesterol Assay is based on cholesterol esterase hydrolysis of cholesterol esters to form free cholesterol and cholesterol dehydrogenase catalyzed conversion of cholesterol to cholest-4-ene-3-one, in which NAD is reduced to NADH. The optical density of the formed NADH at 340 nm is directly proportionate to the cholesterol concentration in the sample. 1. I would like to know whether egg yolk can be used for such a kit. If this doesn’t work, can you suggest us another protocol, please? 1. Prepare extraction buffer with 5 vol isopropanol, 2 vol water, 2 vol Triton X-100. 2. In a 1.5mL Eppendorf tube, mix 50µL yolk with 450 µL of the extraction buffer. Vortex for at least 30 sec. 3. Centrifuge 4 min at 14,000rpm on a table centrifuge. 4. Remove supernatant and perform cholesterol assay. 2. What is the principle of the ECCH-100 cholesterol assay? Cholesterol esterase cleaves esters into cholesterol, which is oxidized to form NADH in the presence of cholesterol dehydrogenase. The produced NADH is measured colorimetrically. 3. 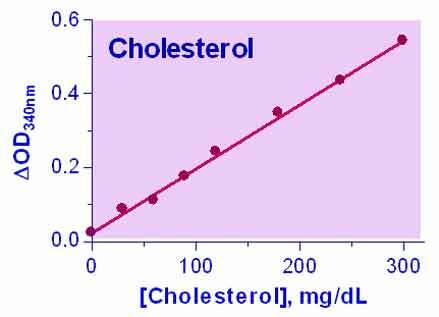 Will the assay detect the cholesterol in the lipoproteins, or only free-cholesterol in the serum? The assay will detect total serum cholesterol, i.e. protein-bound serum (VLDL/LDL/HDL) and free cholesterol. 1. Henein, HY et al (2011). Effect of adrenomedullin gene delivery on insulin resistance in type 2 diabetic rats. J Adv Res 2(1): 57-64 . Assay: Cholesterol in Rat serum (Pubmed). 2. Rubinstein J et al (2009). Hypercholesterolemia and myocardial function evaluated via tissue doppler imaging. Cardiovasc Ultrasound. 7:56. Assay: Cholesterol in Rabbit serum (Pubmed). 3. Hu, M et al. Effect of prolonged starvation on body weight and blood-chemistry in two horseshoe crab species: Tachypleus tridentatus and Carcinoscorpius rotundicauda (Chelicerata: Xiphosura). Assay: Cholesterol in Horseshoe crab Plasma (Pubmed).